Welcome to Liven Up Jazz Productions. No matter the size of your planned event, we are dedicated to making it sparkle with the sophisticated and lively touch of JAZZ. From small house parties to Hotel Grand Ballrooms, we offer you personal service, helping you create that touch of warmth and atmosphere that will make your event truly special. With our free professional consultation you can be confident in choosing the perfect ensemble in size and volume for your unique venue. Our offerings include solo keyboard or guitar, duos, trios, quartets up to a sextet with vocals-each and every performer an exceptional musician. Create a gracious and exciting atmosphere at your next party that will remain a warm memory long after your guests have departed. Call us today and �Liven Up� your special event. Liven Up Jazz Productions, lead by the saxophonist Perry Conticchio, has been performing at AMIA's Annual Leadership Dinner every year since 2005. This is a very special event for our organization, so we wanted to have a jazz band of the highest caliber. Perry and his musicians are perfect for it. They are always on time, are very professional, have a wide repertoire of music, and are always perfectly in tune with the flow of the dinner, which has a lot of speeches and presentations. I would highly recommend Liven Up Jazz Productions for your next event. I have worked with Perry Conticchio and his group on multiple occasions. They are the most professional group you would ever hope to find. They are always on time. They are always prepared. They come in whatever attire you request. They are incredibly easy to work with, and oh yeah....they are one the most talented groups out there! Since the first time I saw Perry play, I have remained in awe of his talents, and the talents of the musicians he has around him. The music they play is beautiful, and the range of music is out of this world! Whenever I have an event that needs music, Perry is the first person I call. He should be yours as well! Thank you so much for adding to the success of our event with your beautiful music. You & the rest of the band are extremely talented & really added to the ambiance for our event (Las Vegas Charity Night). We look forward to working with you again in the future! Thanks for playing on Friday – all our audience feedback was great. Cocktail Hour Music: Perry Conticchio A last minute decision to go with live Jazz instead of the ipod for the cocktail hour. And what a great decision it was. Perry played sax and flute throughout the cocktail hour and was joined by his colleague, a guitar player. The music filled the room without being obtrusive. We got compliment after compliment on the music; Perry wasn’t expensive at all, and was very easy to work with. Thanks so much for the wonderful music you provided for the wedding. We had the most amazing time and, Grant, as well as many guests, picked up on the Led Zeppelin recessional. Grant loved it. Really, we could not be happier with everything. Hearing "God Only Knows" will always make me misty eyed. Again, thank you for everything. You guys were awesome and set the exact tone we were looking for! Mary Mologne McLoughlin, Director, Corporate Accounts, Abiomed, Inc.
From the first plaintive sounds of a 13th century chant, to the exuberance of traditional Southern gospel, and continuing through the intensity and peaceful calm of John Coltrane, "JAZZ IN THE SPIRIT" takes audiences of all ages through a magical musical journey unlike any other. 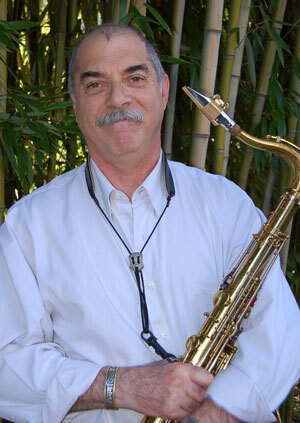 This ongoing project of DC area jazz saxophonist, Perry John Conticchio, was first conceived and brought to fruition with his Quartet at The Olde Town Theatre in 1999. Since then it has been performed in a variety of church settings, coffee houses and concert venues, offering listeners an evolving body of work made up of original compositions as well as new interpretations of works from diverse sacred traditions. Improvisational in nature, the music of "Jazz In The Spirit" provides a broad canvas for a rich and compelling interpretation of the sacred. Non-denominational in design, it has been enjoyed and praised by people of ALL ages. "Jazz In The Spirit" has been performed as two long concert sets with an intermission, two shorter concert sets with an intermission and in two different length single-set shows. Enclosed you will find some sample programs demonstrating some of the different ways this concert can be tailored in length to fit your particular venue. If you are looking for a unique and inspiring jazz concert, this is it! "Perry Conticchio and his fine band bring a muscular spirituality to their performances. Each member provides journeyman support to Perry's soaring sax, while bringing their own light touch to the entire composition. The result is a delight to listen to and a warmth to carry in your heart"
"If you want to explore how jazz can put us in dialogue with the Divine, I highly recommend the Jazz in the Spirit program. Employing the medium of jazz with its improvisatory nature, the Perry Conticchio Jazz Quartet demonstrated how the power of the spirit can inspire the performer and listener to respond to that inspiration with true immediacy. Their program combined new interpretations of traditional music along with original works. Through their music, they provide another means to experience the Divine." - Henry Bauer, Music Director and Co-founder Concert and Arts Series, St. Jane de Chantal Church, Bethesda, Maryland. "Perry Conticchio is a talented technician. 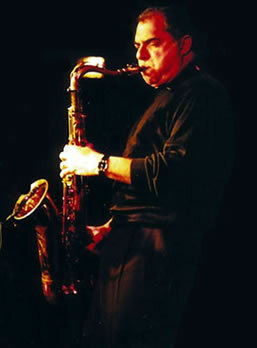 Whether on tenor sax, soprano sax, or on bass clarinet, he plays with inventiveness and nuance. As a leader, he selects excellent sidemen who can follow him through a wide array of material, from Coltrane and Mingus to fresh original compositions and arrangements of traditional tunes. More importantly, however, Conticchio's music evinces an intensity and depth that only decades of contemplative study can produce." "Just Magical" "Delightful" "I was left with a true feeling of Peace" "Wonderful" "You Guys Rock" "Awesome" "Thank You"
This piece was chosen to set the tone of the program. A Christian chant from the 13th century, it also speaks to the often forgotten feminine side of God. This was written with this program in mind. As I was developing the idea in my mind, my wife said I was singing this in my sleep one night with a smile on my face. As with many of my compositions, I consider this a gift from the Divine. Charles Mingus's music has always referred to and been rooted in the music of the African American Church. Both joyous and intense, it speaks to the heights that worship can reach. One of my favorite "traditional" hymns, we have altered the structure and time signature to provide a backdrop for improvisation. Possibly the very first piece I ever heard by John Coltrane, it instantly spoke to me, revealing the depths of spirituality that music could achieve. "A Love Supreme" is considered by many to be John Coltrane's seminal and most important work. This concert would not be complete without an excerpt from it. If you are not familiar with it, I cannot recommend it highly enough. The title to this piece says it all. Its beauty, serenity and peace make it a joy to perform. This is a prayer we often play to close our performances. For a demo please view the last song "01 Spirit Demo" on the Jukebox Tab. All of these samples are LIVE at an event like yours. Unretouched recordings in real situations. No Studio effects or overdubs. or send email to info@livenupjazz.com .